Every year a bunch of cats in the blogging community get together for a fun holiday tradition to celebrate the season. 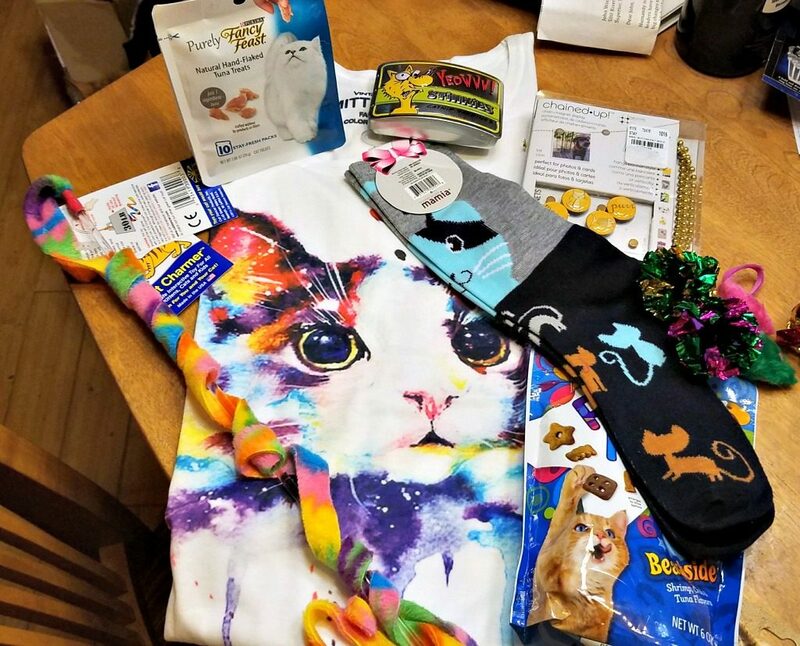 It’s a gift exchange called Secret Paws. The lovely Paula from Sweet Purrfections coordinates the whole shebang. 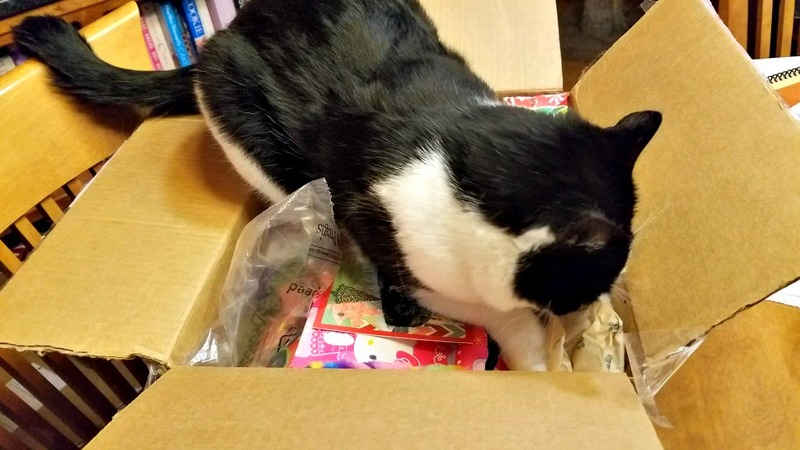 This year the Farm cats sent their presents off to the East coast to the cats of the Cuddlywumps blog. You can see what was sent in this unboxing party post. The Farm cats received their box yesterday from the clowder at The Cat on My Head. It was quite a colorful box, don’t you think? I was very excited to see what was inside. 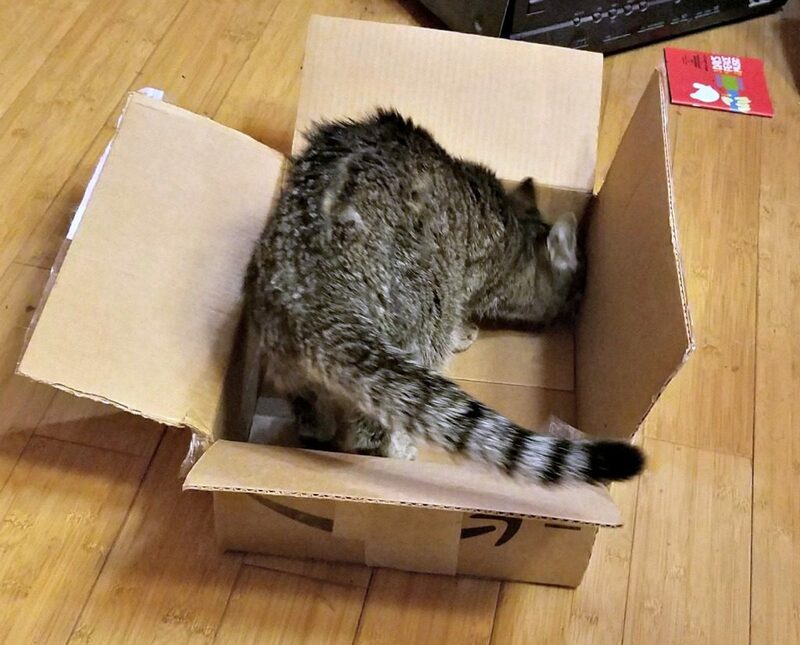 In fact he REALLY wanted to see what was inside. I had to pull him out of the box three times before he would let me pull the packages out. There was something in there that was calling his name. The Farm cats LOVE nip nanners! I would have to say they are their favorite cat toys. 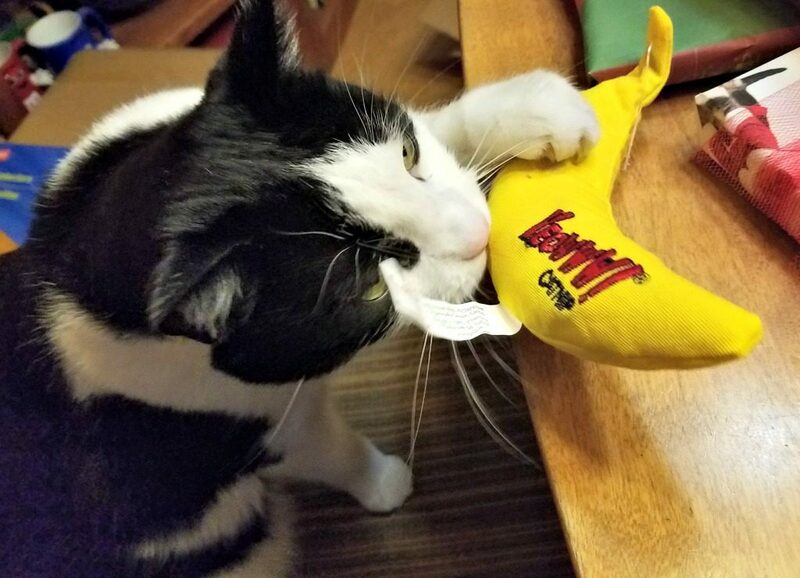 I will note that the nip nanner has now been hidden from me. They do this with their nip nanners. Then suddenly they reappear. I have no clue…. Harry decided he was going to be the chief gift checker outer. 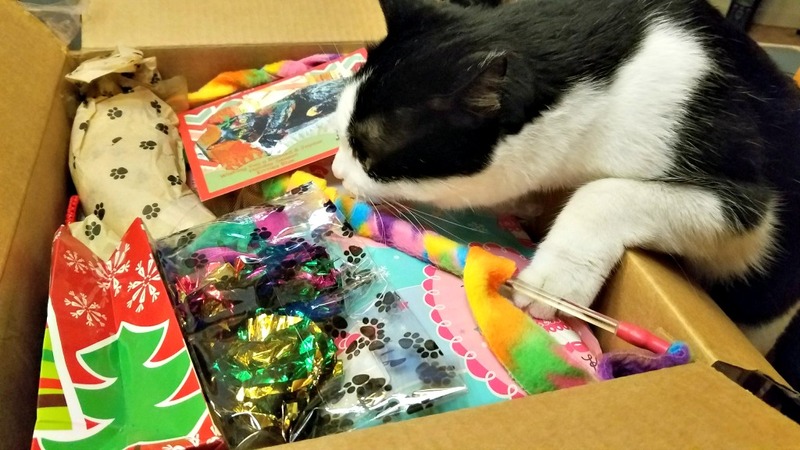 No other cat was allowed near the gifts. He was quite….adamant about this. 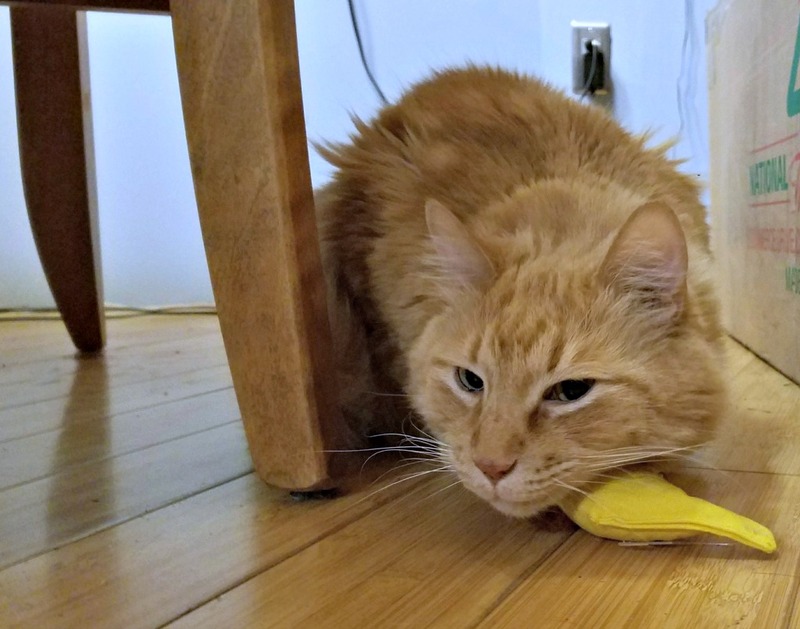 Full approval was given to the nip sardines and the feathered birdie. 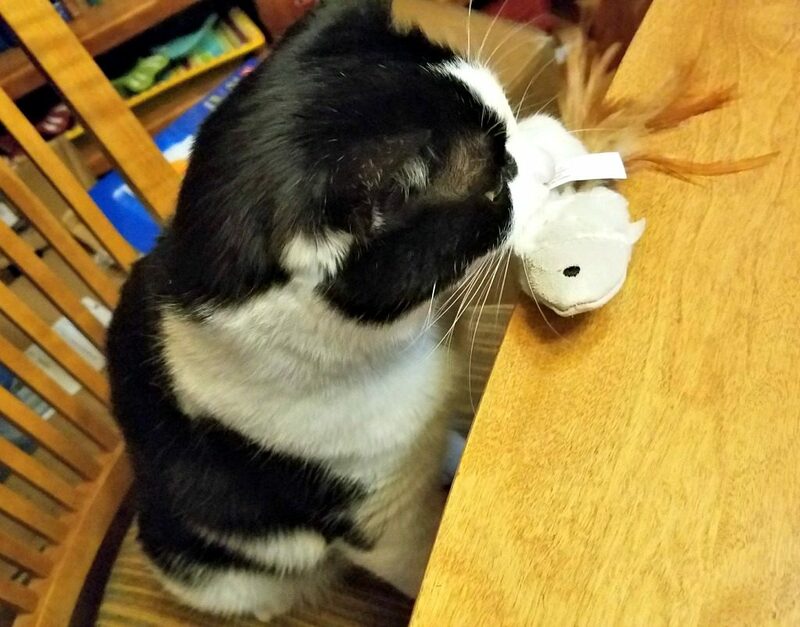 The crinkle balls and mini mousies were also given the A-OK. 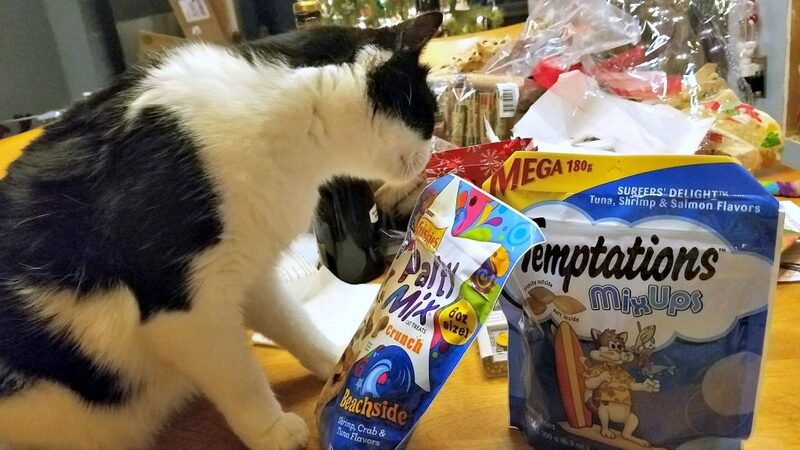 But it was the treats that really took his attention. We all know that Harry is addicted to has a taste for Temptations. Not that he has a problem or anything. Yes he does. A big one. 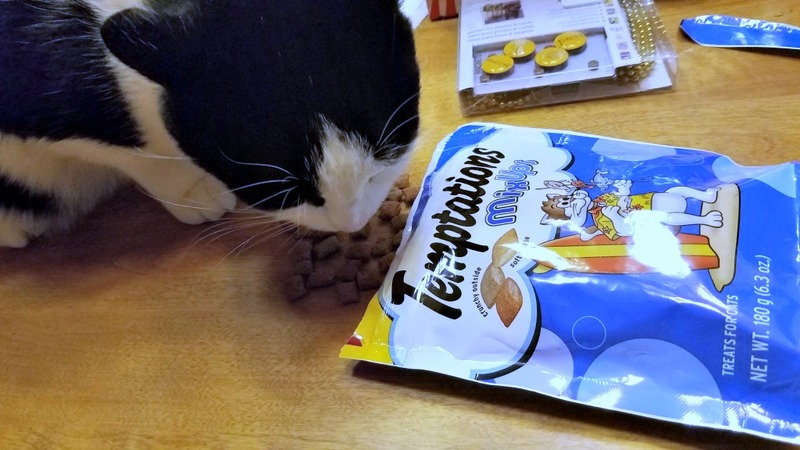 In fact he demanded a taste test. He claimed it was to make sure they were OK for his siblings but I have my suspicions. 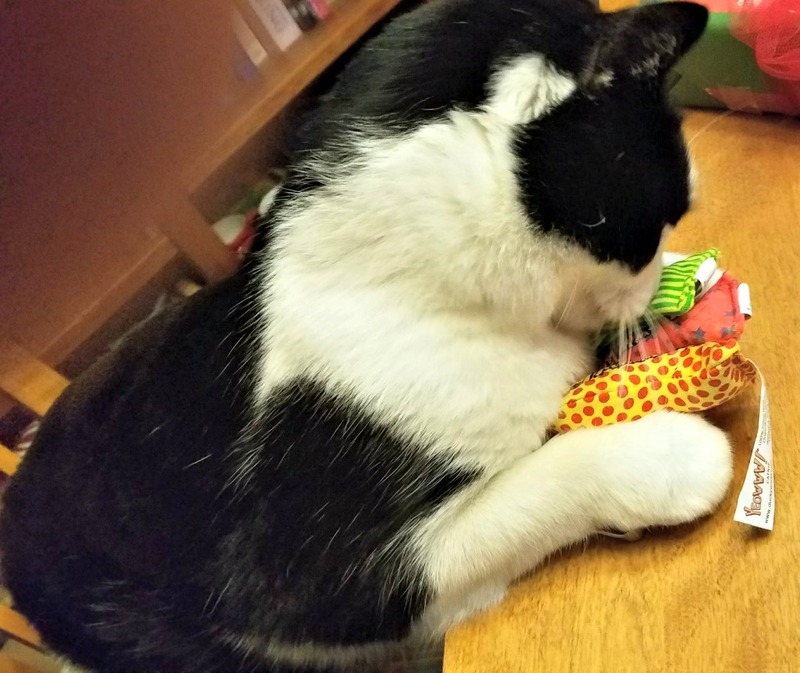 Then he jumped down, gathered up the toys and got….adamant about them again. 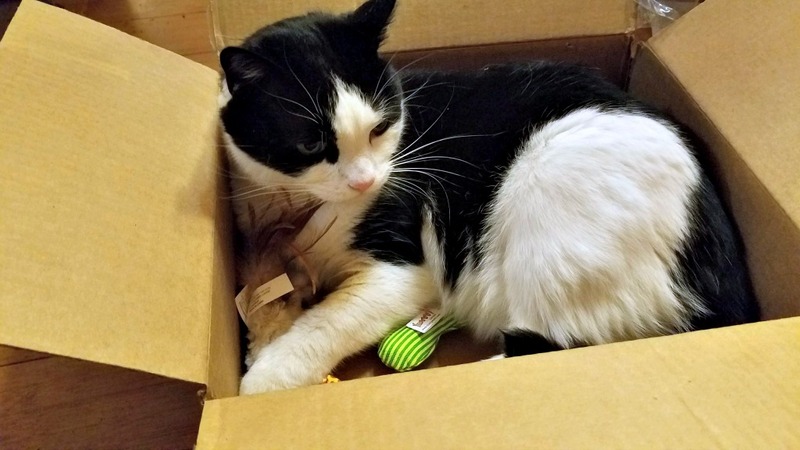 He was not letting any cat near the box, or the toys. You are supposed to share Harry. Eventually he did. I made sure of it. But there was still so much more in the box! 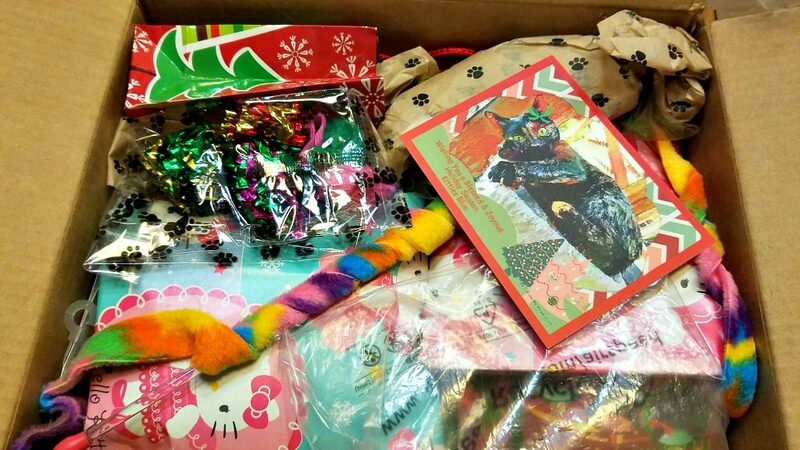 The wonderful human from The Cat on My Head made sure that there were some pretty things for me too! Just look at all of this fun stuff! A beautiful t shirt and pair of cat socks for me and a really cool magnetic hanging chain. 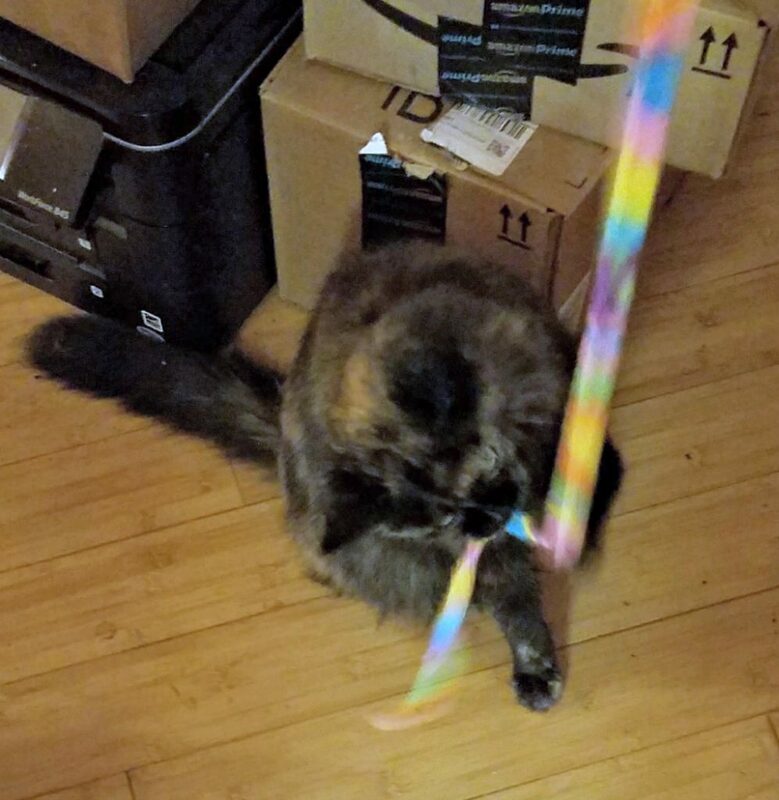 A wormy wand toy that Pumpkin really liked. Harry liked it too, of course but I made him share. And as is to be expected, the box was a big hit. It is still being used. It is the perfect size for a Farm cat. I thank all of the cats and the human at The Cat on my Head for such a wonderful Secret Paws box. We all enjoyed it very much. Merry Christmas to everyone. We hope you all have a wonderful holiday.